Dreams and dreaming are a very important parts of many different esoteric traditions. Dreams are used to diagnose illness, indicate the spiritual state of the dreamer or reveal ordinarily hidden aspects of their mental state, or even to predict the future - an art known as oniermancy. The dream world is often portrayed as a place in which the dreamer can communicate with spiritual entities and touch upon transcendent aspects of reality. In modern esoteric teachings these aspects of the dream world is often attribted to the the dreamer crossing over to the 'astral' dimension through their dreams. 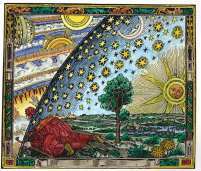 Alhough it is in fact a fairly modern theory, the astral can be thought of as being the way in which humanity experiences the 'world soul' of alchemy, and is the home of the 'collective unconscious' mind first proposed by the psychologist and student of alchemy Carl Jung. As well as being reached through dreams there are also techniques which ave been developed to allow the psychonaught to 'project' directly into the astral realm from wakefulness. These techniques, and the projection itself, are experienced in a similar way to the out of body experiences which can sometimes occur naturally. A lucid dream is one in which you become conscious that you are dreaming without waking up, and therefore gain the ability to control elements of the dream which you wouldn’t normally be able to.